One of the things to take into consideration when buying an older boat is that while the hull itself may be in great shape, you’re going to have to spend some money updating other things. 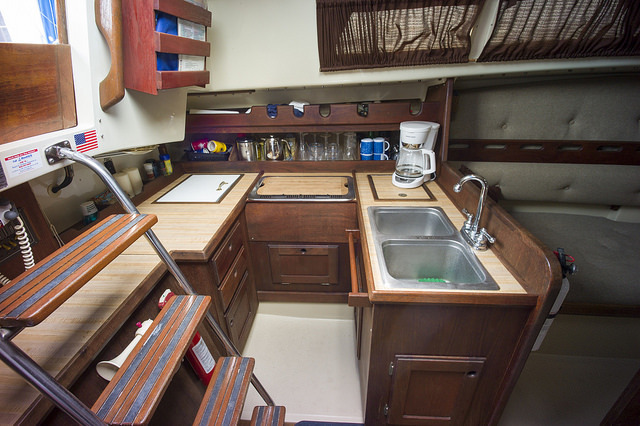 O’day 34s were constructed with two large iceboxes in the galley. Sometime in Gimme Shelter’s past a previous owner converted the aft icebox into a refrigerator with an Adler/Barbour Cold Machine. It wasn’t a terrible installation. They mounted to compressor in the lazarette and used the correct size wires run directly to the house batteries with its own breaker switch. However, they mounted the evaporator very high in the icebox, so that there was no space to add any insulation to the icebox lid. This creates moisture and sweat on the counter, which in turn rots out the plywood icebox lids. Last year I constructed a new lid, which I sealed with epoxy to hopefully stop the rotting. I also added a layer of neoprene on the bottom of it in hopes of improving the efficiency of the refrigerator. It was only a matter of months before the cold and moisture destroyed the glue holding the neoprene onto the bottom. In the winter we still had ice forming on the counter. In the summer we still had a damp counter. To make matters worse, during the heat of the summer, the battery charger couldn’t keep up with the refrigerator’s draw on the house batteries. We started having to turn off the refrigerator when we left the boat because without the air-conditioner running to keep the ambient temperature lower in the cabin, the refrigerator would run non-stop and run the batteries flat. We knew we had to do something, but when you’re a frugal boater (aka cheap), it’s hard to spend money re-working something that already functions enough to get you by. Well, last week we arrived to the boat and flipped on the refrigerator breaker only to get no response. It was dead as a doorknob. 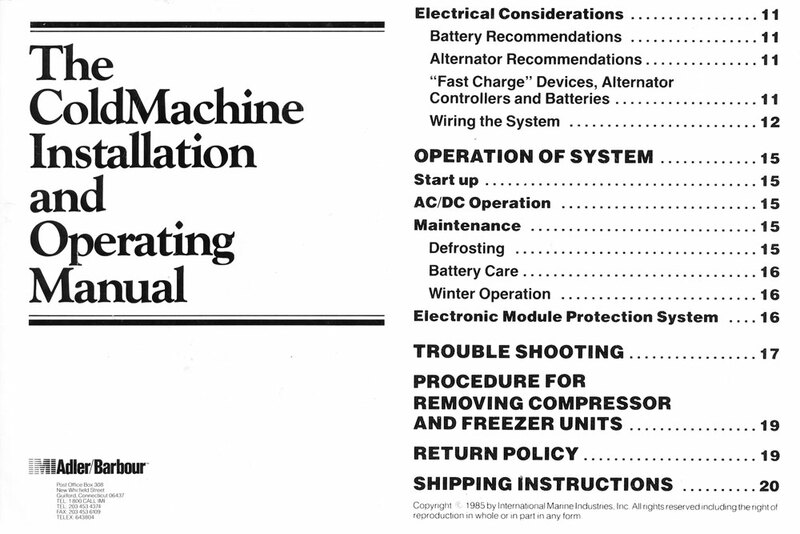 In fact, I went scrounging through the folder of old receipts and manuals presented to us by the previous owner, and it turns out our refrigerator dates back to around 1985 — at least, that’s the copyright on the installation instructions. Adler/Barbour is also now owned by Waeco, part of the Dometic Group, instead of IMI. While Andy’s troubleshooting showed that it’s probably the control unit that has gone bad, the four-pin control unit is no longer made. However, you can allegedly use a Frigoboat controller unit as a replacement. That’s a $285 non-refundable gamble I’m not will to make on a 30-year-old system that already had some fundamental problems. Since the thermostat and evaporator seemed fine, our next option was to just replace the compressor/condendor unit. Unfortunately, our system is still running R12 freon, so I’m not sure how the evaporator would react if we hooked a new R134a compressor up to it. Not to mention the fact that Adler/Barbour has changed the connections on their lines sometime in the past three decades, and we’d have to pay an additional $199 for the adapter kit. Seriously, how are those two short copper tubes worth $199?!!! It looks like we’re going to have to negate our membership in the Adler/Barbour Historical Preservation Society and rip the old refrigerator out next weekend. Right now we’re leaning towards this Isotherm Refrigeration Kit, which uses the same Danfoss compressor but is a couple hundred dollars cheaper than the Adler/Barbour system. And most importantly, I’m going to install the evaporator in a spot that allows for a very well-insulated lid. Try Rich. He’s a friend of mine and actually lives on his boat. If you were at the boat show, you might have seen that he has ice cream AND cold drinks in his refrig at the same time. It’s a great unit that many old systems are still running. We’ll look into it as we haven’t actually purchased anything yet, but the Isotherm holding plate systems have really bad reviews. I replaced our Cold Machine about a year ago. I found one online for alot cheaper than anywhere else. Also have the old parts, if you can use them. Do you have a working 4-pin control board?